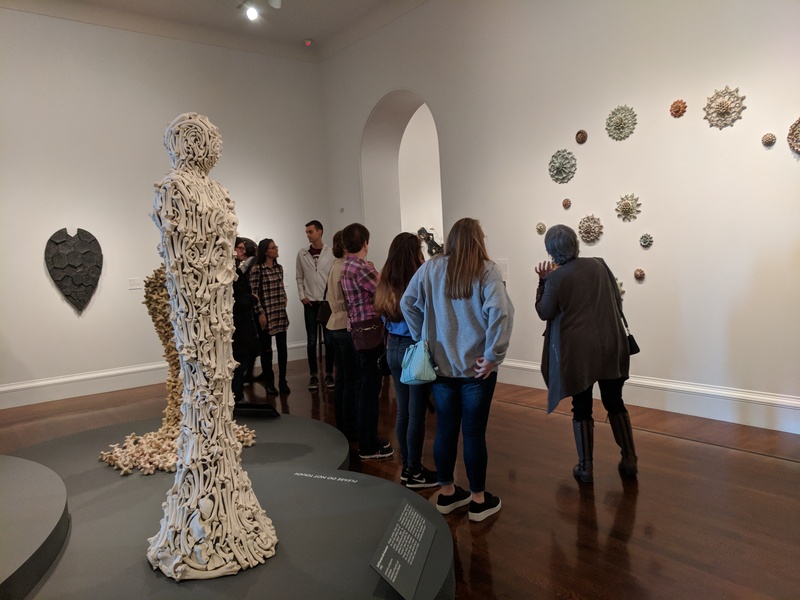 On Saturday, February 24th, we gathered at the Cincinnati Art Museum with a group of mostly Clermont County residents for a special walkthrough of Ana England‘s Kinship conducted by the artist herself. We are so grateful to Ana for her generosity in sharing her work with us. It was truly an eye-opening and inspiring day for all who attended. Note: Kinship closes on March 4th. Don’t miss your chance to see it! Admission to the Cincinnati Art Museum is free. We first encountered Ana’s work in the fall when we visited the Cincinnati Art Museum with our research assistant, Alec Guenther. We were excited to learn that the artist behind the sprawling two-gallery exhibition was from Felicity, just one town over from Bethel. We knew immediately we wanted to meet her. Soil Song, 2008, Ana England (b. 1953), United States, porcelain, burnished carbonized ceramic and bronze, © Ana England. A mutual friend of ours and Ana’s, Rachel Newman, helped connect us. A few months later, we were hurtling up a steep gravel drive on our way to have tea at the artist’s home. Ana and her husband, artist Steven Finke, built their home and studios on 42 wooded acres in Felicity after being pushed out of their Cincinnati live/work spaces by investors one too many times. Ana explained to us that developing an intimacy with this land has greatly informed hers and Steven’s work; many of the materials they use for artmaking are sourced directly from their property. Even their home reflects this relationship with place, we noticed as we sipped chai from homemade clay mugs and admired the home’s beautifully crafted interior. After finishing our tea, we headed to the barn where Ana and Steven have their studios. On the way, Ana pointed to a stunning mosaic above the house’s front door. She explained how she had handcrafted each tile by pressing clay slabs against various natural materials. We were moved by the reverence and curiosity with which Ana and Steven engage the land. In touring their studios, we came to understand how learning about and caring for the land has become a vital part of their artistic practices. Ana shows us a sculpture made from wood found on her property and marked by the destructive Emerald Ash Borer. Ana and Steven’s greenhouse is temporarily being used to dry wood Steven sourced from one of their cherry trees. Just recently, we had the privilege of returning to Ana and Steven’s to participate in a tradition that further demonstrates their relationship to the land and its resources: Maple Syrup Day. Ana and Steven’s Maple Syrup Day happens once a year when they have collected enough sap from their maple trees to make a sufficient amount of syrup. It is a daylong outdoor celebration with friends, neighbors, and colleagues. Ana and Steven walked us through the process of making the syrup, which first involves collecting sap over a period of time by tapping the trees. They explained that it takes roughly 40 gallons of sap to make one gallon of syrup, and that the amount of sap collected varies greatly from day to day depending on the weather. The pictures below show Francesca standing under a tapped tree, trying to catch a drop of sap on her tongue. In order for the sap to become syrup, it must cook down for 14 hours. The apparatus Ana and Steven use for this task is a hulking wood-fired stove of sorts built by Steven and affectionately named “Sugar Daddy.” Steven has perfected the stove over many years of trial and error. It is made of parts sourced from restaurant equipment and leftover pieces from his sculpture practice. We feel immensely grateful to have been included in such a rich tradition. We enjoyed the company, conversation, and especially the tea made with maple sap, which carries just a hint of sweetness. When Ana offered us a short tour of the property, we were excited to see some of Steven’s site-specific sculptures. Steven’s investigation of the Tibetan Book of the Dead has led him to integrate “forest, sculpture, and human in an aesthetic meditation on impermanence.” The works are part of a series that is still in progress. Steven intends to add more sculptures to the premises and eventually to offer individual visitors the chance to experience the meditative power of the works while walking through the forest. Our tour was slightly less formal than that, but we did have the pleasure of being accompanied by Ana and Steven’s dogs, who gladly showed us the way after Ana had gone back to the party. Jim Dine’s Pinochio (Emotional) greets visitors on their way into the museum. When Ana learned about our work in Bethel, she offered to give a personal tour of Kinship for anyone in our network who might be interested. We were thrilled at the opportunity to share Ana’s work with the local community, especially the students we’ve been working with through Empower Youth, and Ana shared our excitement. For many who attended the tour, this was their first visit to the Cincinnati Art Museum. Before the tour began, Ana gave our group a little time to view the artwork on our own. The gallery echoed with delighted voices as we explored the work. During the tour, Ana illuminated for us the conceptual underpinnings of much of the work, which draws equally from science, spirituality, and personal observation. She also outlined the specific techniques and processes she used to make each piece. Our conversations with the attendees after the tour revealed a shared sense of awe toward the complexity of thought behind each piece. Many in the group came away with new perspectives on art and the artistic process. During the discussion that followed the walkthrough, Ana stressed the importance of local communities participating in cultural spaces like museums. Cincinnati is unique in that many of its cultural institutions are free to the public, and it is part of SOIL SERIES‘s mission to connect rural residents to these cultural resources. We are so grateful to Ana England for her incredible generosity. Stay tuned for more information about upcoming events and field trips by following our Facebook and Instagram.